June 10th, 2011 | Lifestyle. What comes with moving season? Garage Sales! Yes, they seem to be everywhere this time of year, and you are sure to have spotted one or another driving through your neighborhood or local suburb. If you’ve ever hosted a sale, you know they are time-consuming and a lot of work, and sometimes they don’t end up being worth the hassle. But we say, good for you for trying, as Wheaton recommends Moving Tip #21: Have a garage sale. Organize it, advertise it and manage it. You’ll be amazed to see how profitably your trash can become some else’s treasure. 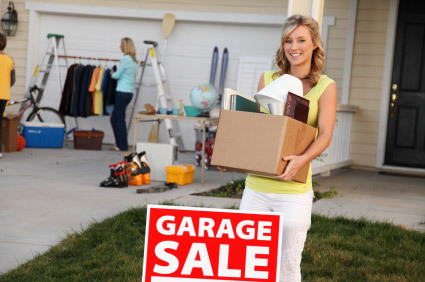 Garage Sales are also a great way to get the children involved in helping out, have them go through their old toys and clothes and pick out what they want to keep and get rid of. When it comes to the big day, the most important thing is making sure people know about your big sale. Therefore we also recommend Moving Tip #22: Advertise in the classifieds or online. For more valuable items, post a classified ad in your local paper or online. Many Web sites offer free or low-cost listings that can reach hundreds or thousands of people. Try www.craigslist.com, for example. This is a great resource, as thousands use Craigs List for finding garage sales around their area.